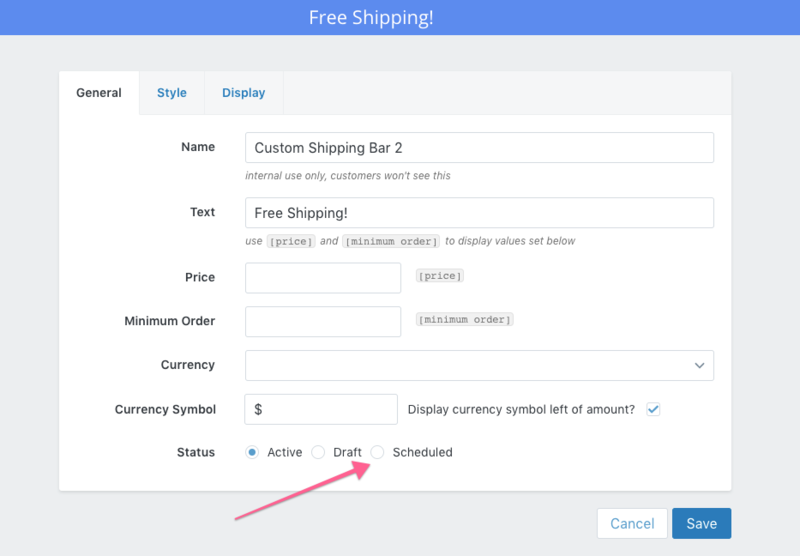 If you have a promotion or are offering free shipping for a specific amount of time, scheduling a shipping bar is a great option. 1. Change the status of your shipping bar to Scheduled. 2. Select your time zone from the drop-down. 3. Choose a Start Date and a Start Time. If you would like your scheduled bar to appear immediately, leave these fields blank. 4. Choose an End Date and an End Time. If you would like your scheduled bar to appear indefinitely, leave these fields blank. P.S. If you have an active shipping bar, and you schedule a second bar, the scheduled bar will replace your active bar during its active time period.